A gallery wrap is an image printed on canvas that has been prepared with extra borders which wrap around the sides and back of the stretcher bar. “Traditional” gallery wrap images are “mirrored”, meaning the 4 edges of the actual image are copied & flipped over as part of the digital image file to be printed. Why do the Gallery Wrap Technique? 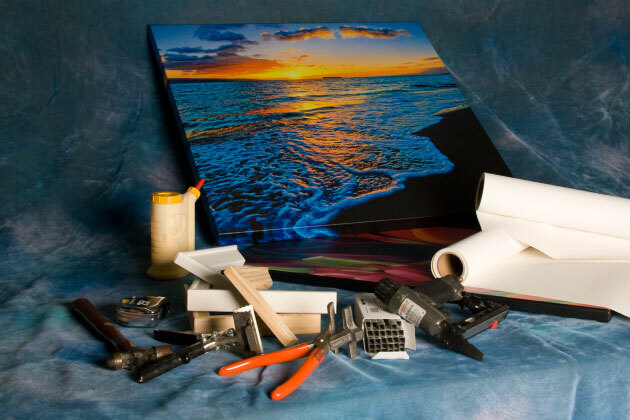 A finished gallery wrap image can hang “as is”, without requiring a frame. Thus it is an inexpensive, classy way to display art work. of a Gallery Wrap Easy? Yes! First you need to know the actual image size. Let’s choose 24×30 as an example. Next you need to know the depth of the stretcher bar. A common depth is 1 1/2”, and we’ll use that in our example. The last measurement you need to prepare the file is how much canvas you need to wrap around the back and allow the stretching device to grab & pull the canvas tight. For this example, we will also use 1 1/2”. 1 1/2 + 1 1/2 + 24 + 1 1/2 + 1 1/2 = 30. Put simply, 1 1/2 four times = 6, so just add 6” to each dimension.